Your customer needs a clean and safe kitchen. This is why it uses a kitchen exhaust system, and also removes the "bad atmosphere". With UV solutions, your system will remain grease-free and the exhaust air almost odour-free permanently. 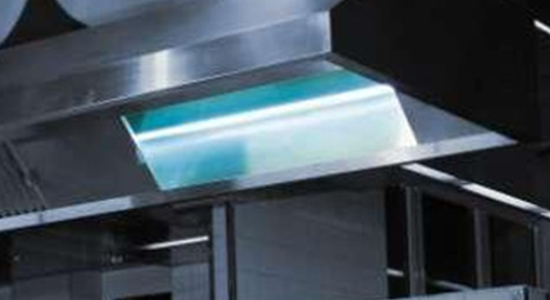 Grease deposits in extractor hoods and exhaust air ducts of commercial kitchens cause high cleaning costs, severe odour nuisances and increased fire hazards. Treatment with high-energy UV radiation photolyses, destroys and neutralises the molecules of greases and odours. This keeps the surface of the extractor hood clean and substantially facilitates the cleaning of the exhaust air duct. Where daily cleaning by hand was required before, the exhaust air duct now needs almost no manual cleaning at all. This is confirmed also by the Heraeus canteen staff. See how UV light can reduce odor and grease in the gastronomy!